MOSCOW, (RIA Novosti) – A Rokot carrier rocket has orbited three Russian military satellites, a spokesman for Russia’s Space Forces said. 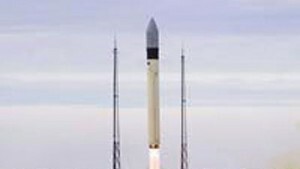 The Rokot, carrying three Cosmos-series satellites, was launched by Russia’s Space Forces from the Plesetsk space center in northwest Russia early on Monday, Lt. Col. Alexei Zolotukhin said. Russia reportedly operates a network of about 60-70 military reconnaissance satellites. Some experts believe the new satellites could be part of Russia’s Oko (Eye) orbital missile early warning network. Copyright 2009 RIA Novosti. All rights reserved.